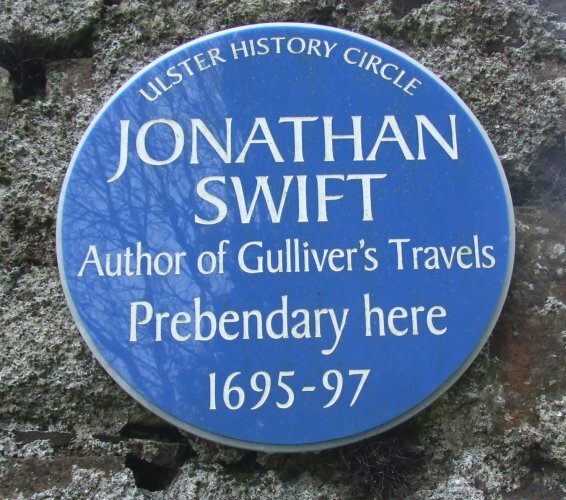 Born in Dublin on 30 November 1667, of English parents, Swift was the greatest satirist of his age. He was educated at Kilkenny College and Trinity College Dublin. He went to England in 1689 and became secretary to Sir William Temple at Moor Park, Farnham, Surrey; while there he met the young Esther Johnson, who, as `Stella’, was to remain a close friend for life. 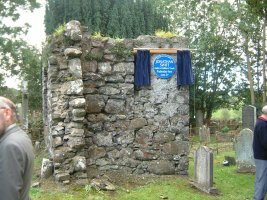 Ordained in the Church of Ireland in 1695, he was appointed curate at Kilroot, near Lame, Co. Antrim, where he stayed for just one year. His first major work, A Tale of a Tub (1704), was a satirical attack on `the Abuses and Corruptions in Learning and Religion’. Between 1699-1710 he was in London to represent the Church of Ireland seeking the relief from ecclesiastical taxes. From 1710 he was a close confidant of Harley and Bolingbroke, then at the centre of English political and literary life. He wrote propaganda for the Tory government. He was a founder-member of the Scriblerus Club with his friends Alexander Pope, John Arbuthnot and John Gay. Swift did not get the position he sought, an English bishopric, but was made Dean of St Patrick’s Cathedral, Dublin. 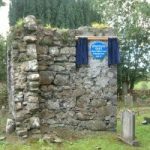 Within six years, roused by the injustices in the relationship between England and Ireland, he took up his pen on the Irish side with such success that he became known as the ‘Hibemian Patriot’. His Proposal for the Universal Use of Irish Manufacture (1720) urged the Irish people to boycott English goods, while The Draper’s Letters urged them not to accept the new coinage imposed on them by the English government. 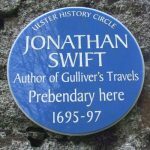 During the 1720s and 30s Swift was the centre of a wide circle of Dublin wits and poets and authored many pamphlets. Much of his best verse dates from this time, particularly Verses on the Death of Dr Swift and The Legion Club, an attack on the corrupt Irish Parliament. He also wrote Gulliver’s Travels (1726), the most challenging satire of the age. The 1720s also saw the death of ‘Stella’. From the late 1730s his health declined, he faded from the Dublin scene, and he died on 19 October 1745.